Ugh, how sick are you of reading about the minuscule measurements that make up the 4 C’s? (Cut, clarity, color, carat size). Even if you can become an expert over night, forget it! A diamond’s job is to sparkle. Wrong again! We make sure that designing your own ring costs the same as picking one out of the display. You should be able to choose every detail of an engagement ring- making it unique isn’t more expensive! Hold it right there. You may think that your budget should be all thrown at carat size, but the truth is a smaller diamond that sparkles, is better than a larger, lower quality stone for the same price. Sparkle over size: do we have to say it again? If you’re thinking of resetting a family heirloom, it may save you a few bucks to use the diamond. But if you’ve got a handful of diamonds you want to use, you’ll end up paying way more for labor and settings. 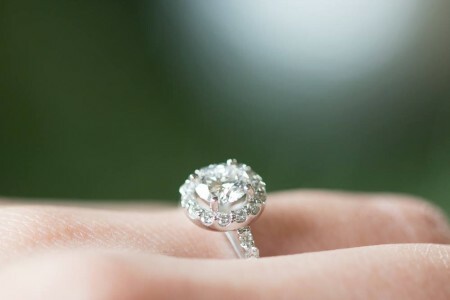 We suggest you trade in the diamonds and lower the cost of the ring! If you’re not sure what she wants, there are lots of ways to find out what kind of ring she’d love, like this cheat sheet. Trust us, the surprise of you proposing with a ring you designed will outweigh the chances of her not liking it.